October 21, 1888. The Wyoming Territories. A scientific excavation discovers a perfectly spherical chamber fifty feet deep in solid rock. The chamber holds a mysterious device, apparently capable of generating electricity from thin air. It could change the world. But even more fascinating is the metal frame nearby, which, when powered in the proper way, opens up to reveal a corridor that can only be described as... otherworldly. Who made these devices? Are they safe to use? One thing is for sure, though: it's time to explore. Worldgate is a new point-and-click adventure game by William Buchanan, developer of The Free Will Cycle series. At the start, you may choose whether to navigate by mouse or by keyboard, and whether to display direction arrows on-screen. Using the [WASD] or [Arrow Keys] or clicking the arrows with the mouse, you'll turn left and right, and step forward and backward to navigate around the landscape. Click an object onscreen to examine, manipulate, or add it to your inventory. Once an object is in your inventory, you may examine it by clicking its inspection icon in the lower right, or click to select it to use with an onscreen object. Some objects can be adjusted or combined once examined in greater detail. In general, it's best to visit the options menu to customize your experience. 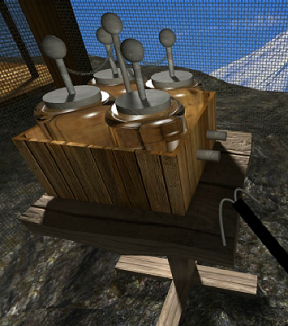 Analysis: It has been fascinating to follow Buchanan as he develops his CHARM adventure game engine. His willingness to listen to and implement feedback from players is admirable, and the result is an upward trajectory of quality that one hopes will never be interrupted. The navigation problems noted by our charmingly handsome writer in the Freewill Cycle Volume 2 review are nowhere to be found, save for a little inventory muddling. Combined with Buchanan's prodigious world-building talents, this make Worldgate an atmospheric piece of science fiction in an attractive package. Puzzles are generally of the "encounter mysterious machines, then figure out how they work" variety, which may frustrate the less gadgety minded of our audience, and there is little explicit plot. 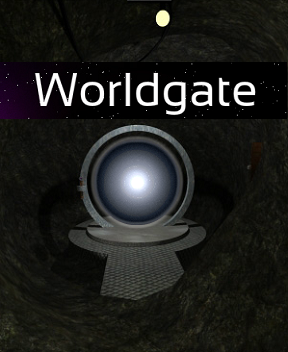 Above all, Worldgate is a game of exploration: of stepping through doors without knowing where they lead, of connecting wires to objects and hoping they won't explode. Unlike many science fiction game, the player-human is not at the mercy of the larger world. You play a scientist who investigates the unknown by choice. There's a cool technology clash between the 19th century tools you have and the advanced alien world you interact with. If your curiosity kills you, than at least you'll know where your towel is, and that is a quite empowering feeling. The big question is, of course, where does Buchanan go from here? His CHARM engine has demonstrated its proficiency in presenting empty, ominous, technological worlds, but will it work as well for lived-in, welcoming, organic worlds? Will we ever get to meet the creatures who make such wonderful toys? The ending of Worldgate implies that the story is nowhere near finished, and frankly, whatever direction the story takes, it's worth waiting all the time in the world for another wonderful adventure. Though, of course, if you Buchanan could get Kurt Russel to sign on for the sequel, we wouldn't, y'know, mind.